Showing results for tags 'clanrats'. Feedback welcomed, how do you like this colorscheme? Do these two lines stack, resulting in +1 hit, +2 wound with 30+ clanrats? I ask because they're missing the "Instead" that other similar rules descriptions include. E.G. I'm finally painting! I have my army list written and a monthly plan to stick to. I've initially got one eye on making my tournament debut at SCGT next year (I know, I'm a slow painter) but I've made a solid start in the past week, so I may well revise my painting plan. I think I'll create a separate blog post for each unit type and add to them as I go, or I might just end up throwing it all in here. We'll see. Anyway, here's pics of my clanrats so far! The Battleline we all know and love. I noticed that there is a lot of gloom around the internet about them being the only battlelite choice (without taking certain clawpacks) and wanted to open a discussion. Are they even worth bringing? Which is better to take, Rusty Spears or Rusty Blades? What is the best strategy for them? Are they even worth bringing? 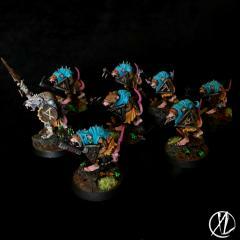 I have seen lots of people online post a tiny unit of 10 rats to fill out their battleline requirement. True, 10 models can mean the difference in scoring objective points, but those 10 rats couldn’t scratch soap and are going to be obliterated in one combat. So, how do we make them worth bringing? Let's take the best case scenario: 30 Clanrats with Verminus Clawpack, Warlord, BSB, and Tretch Craventail. That is 60 Rusty Spears hitting on 4+ (rerolling 1s) wounding on 3+ (6s do double damage) averaging out to approx. 29 wounds at rend -1 aka approximately 8 dead Liberators w/Shields before they can attack back. To be fair, that is definitely a best case scenario, but there are some very effective ways to make Clanrats scary. The next question is then: Why take them over Stormvermin? Stormvermin can do everything just mentioned but better. There is no way around it, they simply hit harder, have better saves, and have a better ability. If I were to substitute the 30 Clanrats in the example above for 20 Stormvermin, they would get the same amount of attacks but at -2 rend instead of just -1.  Now, this all may sound like a knock against the Clanrats but it actually is not an insult. I just compared a 180 point Battleline unit to 280 points of elite infantry and the only notable difference is an extra -1 rend. The Stormvermin’s better save is mitigated by the Clanrats having more models, which can be useful against mortal wound dishers. Are the Rusty Spears better than Rusty Blades? Obviously, Rusty Blades are better than Rusty Spears assuming every model can attack. But that is rarely the case with hordes as big as Skaven usually are. See this thread on Skaven units for help getting the 2nd and 3rd ranks in range: Example: 10 Clanrats vs 10 Skeletons The Clanrats should have no problem getting in range of the skeletons Scenario 1: The Clanrats have Blades and all 10 of them are in range of the Skellies. They will do an average of 2.5 wounds. (hitting on 4+ wounding on 4+) Scenario 2: The Clanrats have Spears and all 10 of them are in range of the Skellies. They will do an average of 1.67 wounds. (hitting on 5+ wounding on 4+) As expected, the Blades are better than the Spears. Example: 20 Clanrats vs 1 Treelord Some of the Clanrats will have trouble reaching the Treelord. Note: Both weapons get a +1 to wound for having 20 models Scenario 1: The Clanrats have Blades and only 10 of them are in range of the Treelord. They will do an average of 3.33 wounds. (hitting on 4+ wounding on 3+) Scenario 2: The Clanrats have Spears and only 15 of them are in range of the Treelord. They will do an average of 3.33 wounds. (hitting on 5+ wounding on 3+) Notice that neither are better in this scenario. The balance tips as soon as either can get more models in range. Example: 40 Clanrats vs 5 Liberators The Clanrats will definitely have trouble getting every model within 1" of the Liberators. Note: Both weapons get a +1 to hit and +1 to wound for having more than 30 models Scenario 1: The Clanrats have Blades and only 15 of them are in range of the Liberators. They will do an average of 6.67 wounds. (hitting on 3+ wounding on 3+) Scenario 2: The Clanrats have Spears and only 25 of them are in range of the Liberators. They will do an average of 8.33 wounds. (hitting on 4+ wounding on 3+) The Spears are suddenly much better than the blades. Conclusion: Spears are better if it means you can attack with more models. The rule of thumb is that 2 Blades = 3 Spears, so Spears are more powerful if it means you are attacking with 50% more models than you would with Blades. Note that this does not take into account buffs. 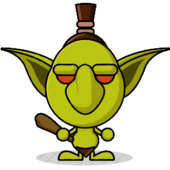 Buffs like "Gnash Gnaw on their Bones!" and the BSB standard to reroll 1s skews the results heavily towards Spears if it means that there are more models in combat. Use Spears in your big groups to take advantage of this, use Blades in your small units where you are confident they will all be able to get in that 1" range. Strategy: Retreat! They don't call it a Vermintide for nothin' Something not talked about enough is the impact of the Clanrats and Stormvermin standard bearer and musician. Clanrats are designed to retreat. With the retreat rules as unclear as they are, take advantage of retreating simply to reposition. Use the ability to retreat and charge in the same turn to ebb and flow into and out of hot areas. 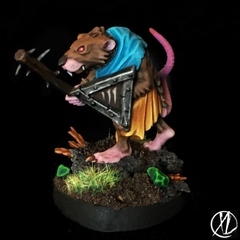 Clanrats are one of the most mobile hordes in the game after they have engaged in combat. On your turn, if you think you can get more rats in range, feel free to disengage and re-charge the same enemy. Or charge a different one - 8 inch retreat plus 2d6 charge range means your Clanrats are moving at a speed of 15" on average on a retreat-charge. Remember, that is a 15" threat bubble that still applies when the Clanrats are in combat. That is fast repositioning that slower units won't be able to keep up with. Let me know your thoughts - I just felt the need to defend the viability of Clanrats.